October | 2016 | Historic Cabarrus Association, Inc. Historic Cabarrus Association, Inc. will be hosting their Annual Fundraiser, Preservation and Pints, at Cabarrus Brewing Company on Friday November 4th. Jim N’ Nick’s BBQ will be catering the event with a large array of delicious BBQ pork, chicken, and sides and Cabarrus Brewing Company will provide local beer and wine. There will be a cocktail hour beginning at 6:30 p.m. followed by dinner. After dinner, the entertainment will continue into the evening as KanePunch Comedy will lead the crowd with History-themed Trivia! 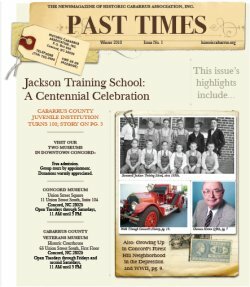 Brush up on your American, North Carolina, and Cabarrus County history and be prepared to laugh and enjoy the evening’s entertainment.